Some may think of French fries as just a side to burgers and steaks, but smart people know that the perfect French fry can stand on its own (and, you know, it doesn't hurt when there's some cheese on top). 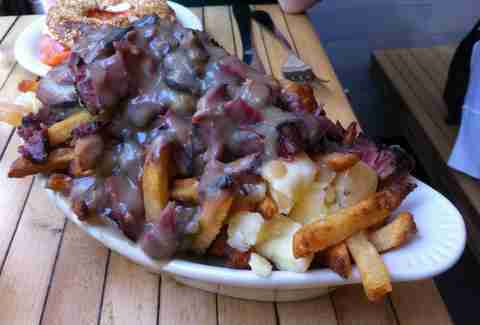 Whether you like them crispy and plain, covered in cheese curds and gravy, or fried three times, these are the absolute best fries in NYC. 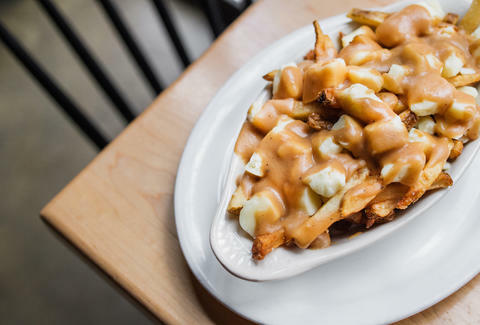 This glorious, gravy-smothered dish already nabs the title as the greatest Canadian export known to mankind (sorry, maple syrup), but Montreal native Noah Bernamoff takes the dish up an extra notch by adding cheddar cheese curds from Maine’s Silvery Moon Creamery and Mile End’s signature smoked meat. Andrew Carmellini knows his way around bistro fare, so it’s no surprise that these are the poster child for shoestring frites done right. Fried twice in canola oil, then seasoned with salt, the sticks manage to stay insanely crisp as you eat them by the handful. A lot of work goes into these golden potato wands and it shows. Russets are peeled, cut, soaked in water overnight, then fried twice and showered with fine sea salt before they end up on your plate. We love banh mi. We love French fries. And this Queens hangout ingeniously COMBINES THE TWO by garnishing crunchy potatoes with classic Vietnamese sandwich fixin's (pickled carrots, daikon, cilantro, and jalapeños), spicy mayo, and a zingy house-made green sauce. Oh, and you can can top it all off with an optional (only in name) fried egg. 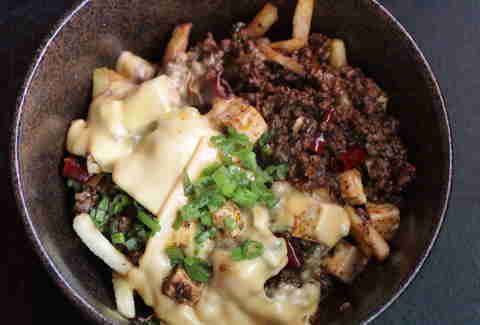 Leave it to the crew that gave us Dorito kimchee carbonara to come up with mapo tofu chili cheese fries, which feature mouth-tingling Szechuan peppercorns, tofu, scallions, and good ol’ American cheese. 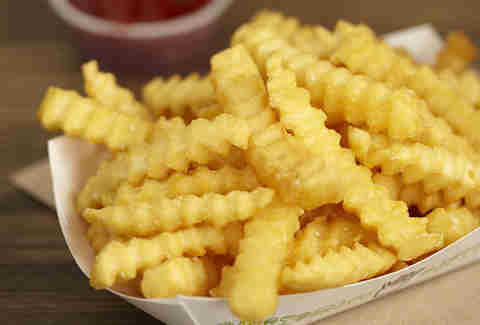 There’s a reason Shake Shack’s fresh, hand-cut fries were booted in favor of these crinkle cut originals. The ridged taters are never limp and actually hold up under their gooey cheese sauce. 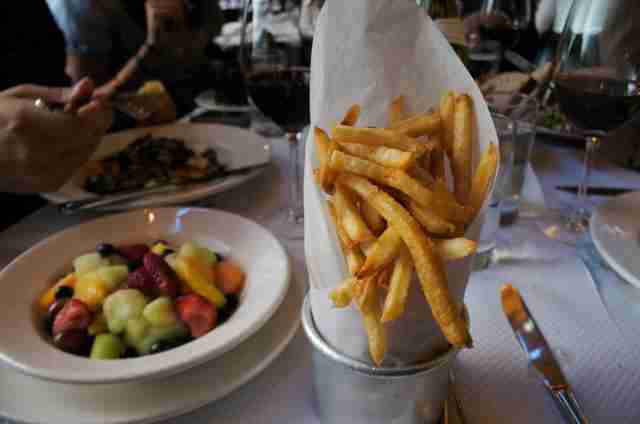 The standard two cooks are not enough for April Bloomfield, who first boils her potatoes then fries the chips -- twice. The extra step results in a superb crackly crust, while the thick-cut shape allows the creamy center to remain intact. There’s cumin mayo for dipping, but the sea salt-dusted fries are pretty spectacular on their own. 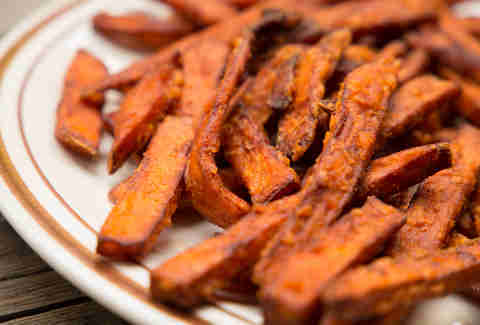 A meal at this brunch-time favorite would not be complete without an overflowing platter of the sweet potato fries. Some are long and some are stubby, but all are equally crisp and well-seasoned. What’s that you say? You can’t put non-potato fries on a best fries list? Well we did ANYWAY, and you’ll thank us later. These aren’t your average carrot sticks, built to deliver tubs of hummus to your face. Here, John Fraser worked his magic to turn the Bugs Bunny snacker into tempura-battered beauties that are snappy and tender all at once. The jalapeño-infused “mayo” also fools you into eating more healthy stuff -- it’s actually made from tofu, sucker.